One year ago today, I organized my largest author birthday celebration ever! I had the pleasure of being on the Right to Read Week committee for my son's elementary school and we decided to focus the school's week-long reading celebration on Bill Martin Jr. because his birthday fell during the week. At one of our meetings, we were planning the special activities for the week when I offered to host a family story time in the evening. The teachers thought it was a great idea and came up with the idea of "Bedtime Stories with Mr. V". It worked out that March 20th was the perfect night to have families return to school to listen to books written by Bill Martin Jr. I was so excited for "Bedtime Stories with Mr. V"! One of my favorite things is to read books to a classroom full of children, but I had always wondered how I would do reading to a larger group. I had little anxiety about hosting this event only because I knew I would be reading familiar books by Bill Martin Jr. that I had read countless times to my children. I selected the books; Baby Bear, Baby Bear, What Do You See?, Fire, Fire Said Mrs. MacGuire, Kitty Cat, Kitty Cat, Are You Going to Sleep? and The Beasty Story. The Beasty Story is my family's favorite book by Bill Martin Jr. (illustrated by Steven Kellogg). In this book, two mice named Hank and Nick set out to play a prank on their friends in the dark, dark wood. They hide a flying-balloon-device inside a dark green bottle in the dark, dark cupboard which was in the dark, dark house. The flying-balloon-device designed by Hank and Nick emerges from the dark green bottle as a beast with yellow eyes as it flies. The mice friends are brave and intrigued by the beast instead of being scared! They follow the beast and with a little help they uncover whose is responsible for this prank. I was determined to make a beast with yellow eyes that flies. It wasn't easy. I endured many failures. Below is a picture of my final and successful attempt. I made it with two helium-filled balloons and a white plastic trash bag. 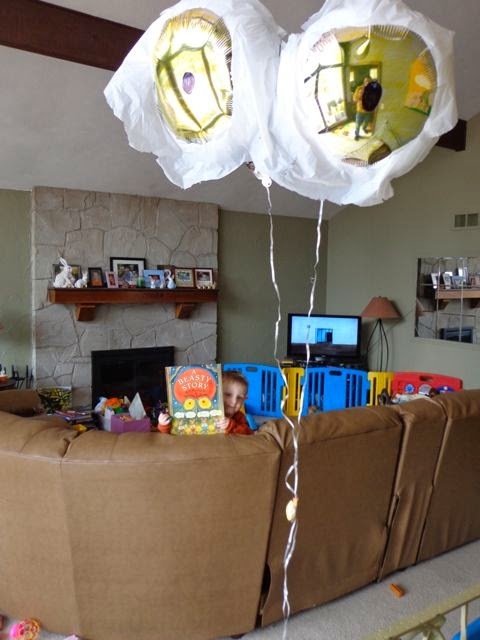 The trick was to not add too much trash-bag-material around the eyes that it would weigh down the balloons. Once I had the balloons right, I copied a picture of Hank and Nick, the trickster mice, and taped them to the ribbon. My son loved the beast so much that he wanted to play with it after we made it, but I was terrified it was going to pop! I made a deal with him. I said, "After 'Bedtime Stories with Mr. V' you can play with the beast as much as you want. But, we can't touch it now." He agreed and the beast made it to the event without popping. Below is a video of me reading The Beasty Story in my Pac-Man Jammies and robe. 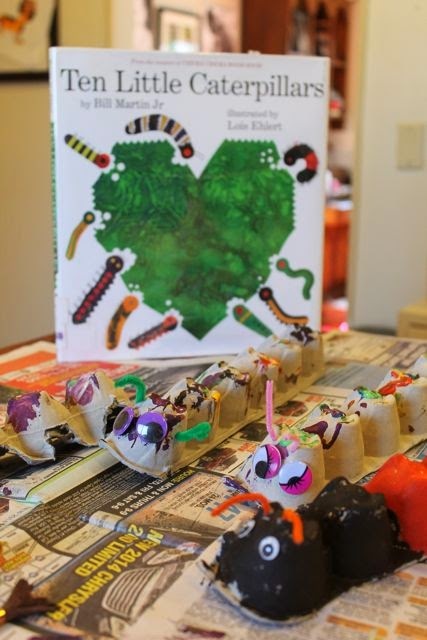 The video starts with us singing Happy Birthday to Bill Martin Jr.
During last year's Right to Read Week celebration I discovered a book written by Bill Martin Jr. that I just loved; Ten Little Caterpillars with artwork by Lois Ehlert! The book was floating around classrooms at my son's school during Right to Read Week with the teachers reading it to their students. I never had the chance to sneak it away to read it to my children. However, this year, I found a copy at our local library and it became the book that inspired this year's birthday celebration for Bill Martin Jr.! 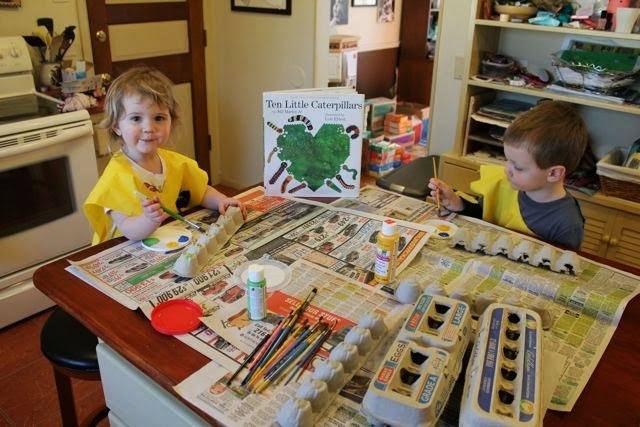 Ten Little Caterpillars was the perfect book for my two youngest children. 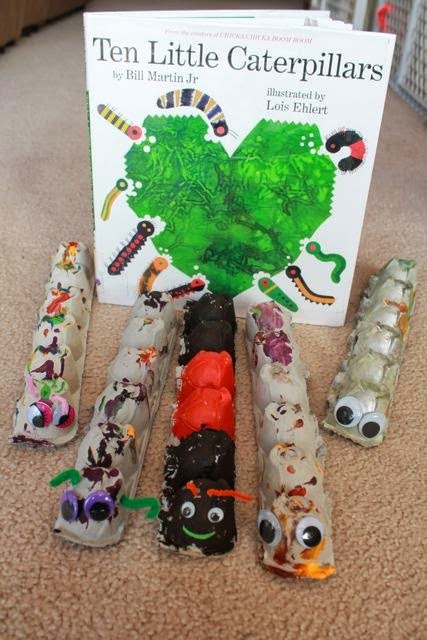 The book is a rhyming story about ten little caterpillars that experience different things like climbing a cabbage head and finding a melon bed. The tenth caterpillar scaled an apple tree and then had something extra special happen to it! The illustrations taught us about ten different types of caterpillars including cabbage looper caterpillar, woolly bear caterpillar, and common wood nymph caterpillar. There is an illustrated section after the story that tells more about each caterpillar and shows whether it turns into a moth or a butterfly. 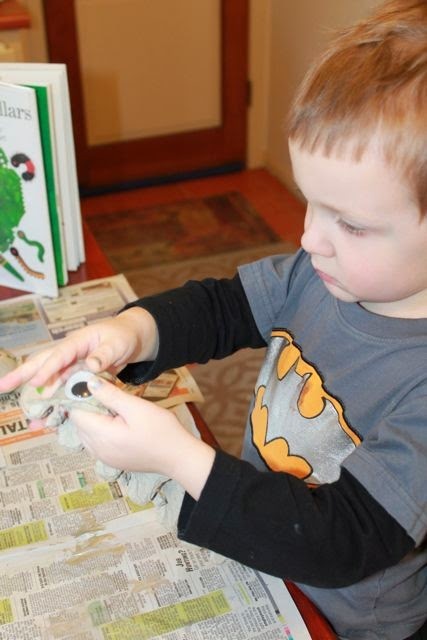 After reading the book, I cut the bottom of an egg carton in half and let them create their own caterpillars. 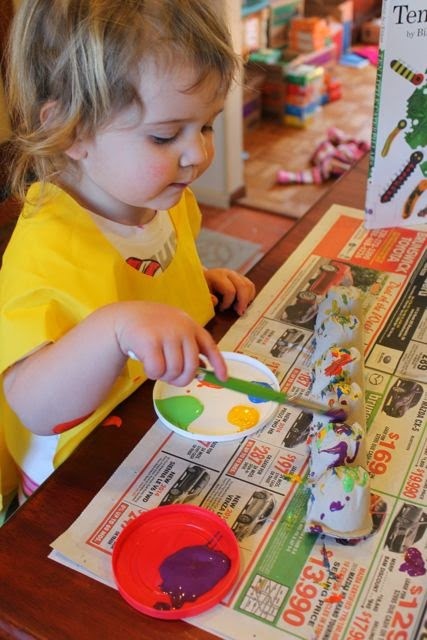 My daughter sang, "Paint, paint, paint" as she painted her caterpillar. 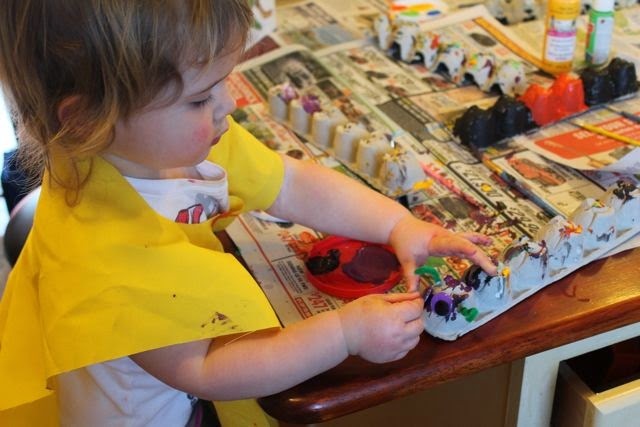 Her brother said that her singing was "annoying" as he concentrated on his painting. We added antennae with pipe cleaners and googily eyes by using glue dots (so much easier than messing with a glue bottle). 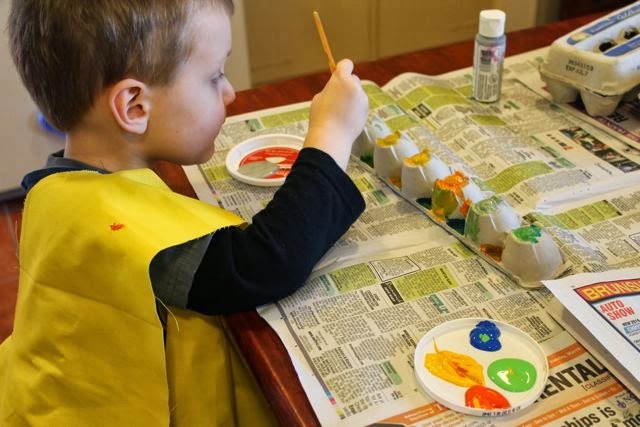 They worked so hard on their caterpillars that I had the opportunity to paint my favorite caterpillar, the woolly bear, which we learned turns into a Isabella Tiger Moth. My son added eyes to his glow-in-the-dark caterpillar. My kids love glow-in-the dark paint!! Please Pin this picture to Pinterest. Do you follow Happy Birthday Author on Pinterest? 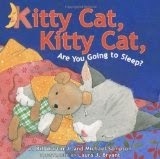 Tonight, I will be back at my son's school doing another "Bedtime Stories with Mr. V". The theme of this year's Right to Read Week is Wild About Books. I will not be reading any books by Bill Martin Jr. but I will be thinking of him because it was his books that sparked the confidence I needed to read and perform for a large group of people!